I decided to dismantle the "spring" vignette in my kitchen corner that I have used for a couple months or more. 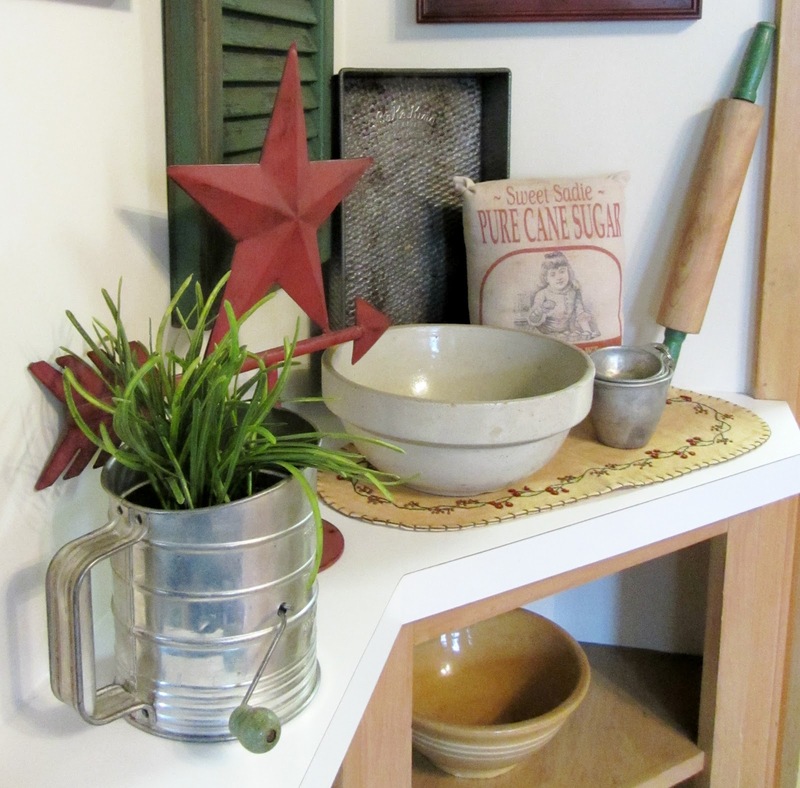 I put together a vintage kitchen vignette from stuff that I have on hand, like: a crockery mixing bowl, a Bromwell flour sifter, a Bake King baking pan, a wooden rolling pin with green painted handles, aluminum Ekco measuring cups, a craft shop sugar advertising sack/pillow, and a faux potted plant. And of course my trusty red star! One would think that I like to bake, but I don't. 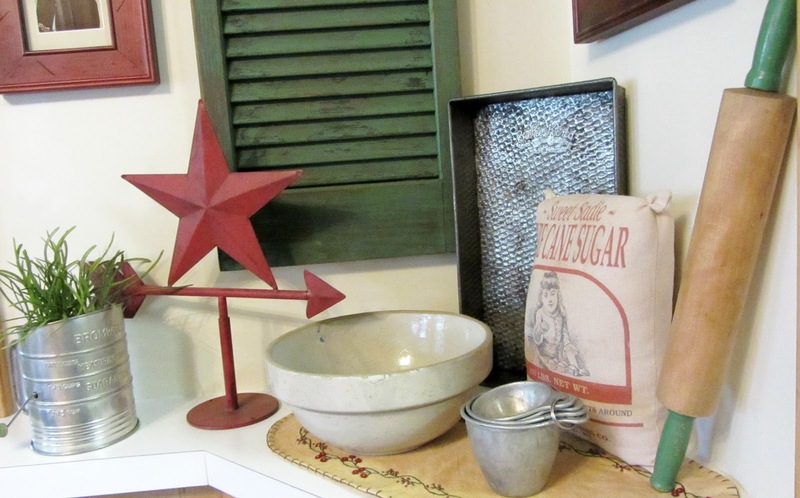 I like vintage kitchen utensils, bowls, etc., just for their decorating value! I have a roast chicken in the oven for dinner, but no baked goods here! I love it! I really like the way you've displayed your crock and bowl collection...I love the symmetry of it! Of course I'm loving the green handles on the rolling.....what's it called? Just kidding. I love to bake and hate to cook, but also like vintage kitchen gadgets and bowls. You have quite a collection! Love this cute collection of goodies!! 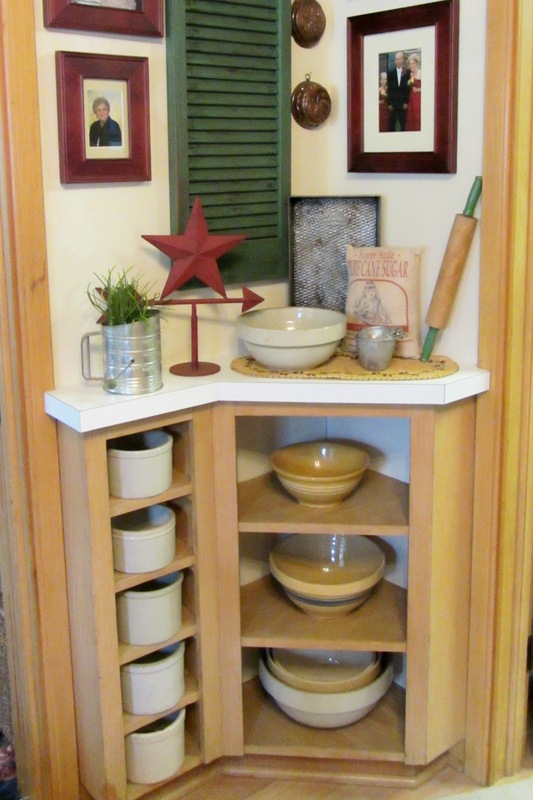 And, I like the cabinet, especially with all the nooks for bowls....Nice job, Faye PS: I don't bake either!!! Your collections and displays are the best, just love this one. Your pottery bowls are amazing. Love your vignette. Very pretty :) Nice colours too. 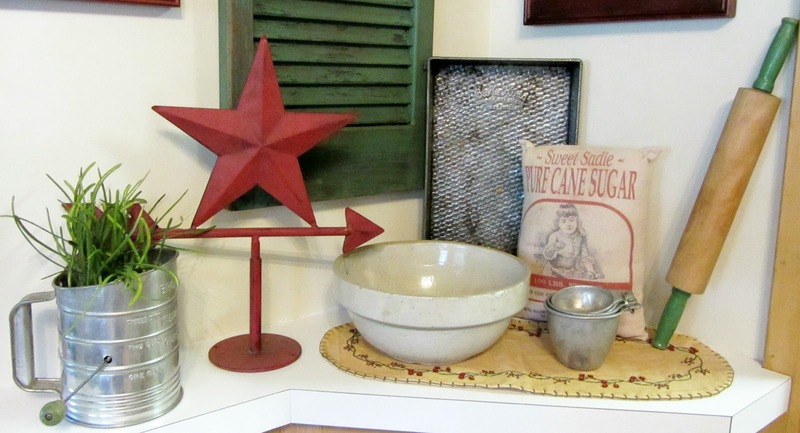 Very cute vintage corner! I love the pillow made to look like a sugar sack. I can envision numbers stenciled to your crocks, ie: 1, 2, etc. What a gorgeous arrangement! Love all your vintage items. Love your display. Your collection looks wonderful in your little corner. Hi Carlene, I also love vintage cook ware. Your display is so charming! You had me at vintage - what a fun display! 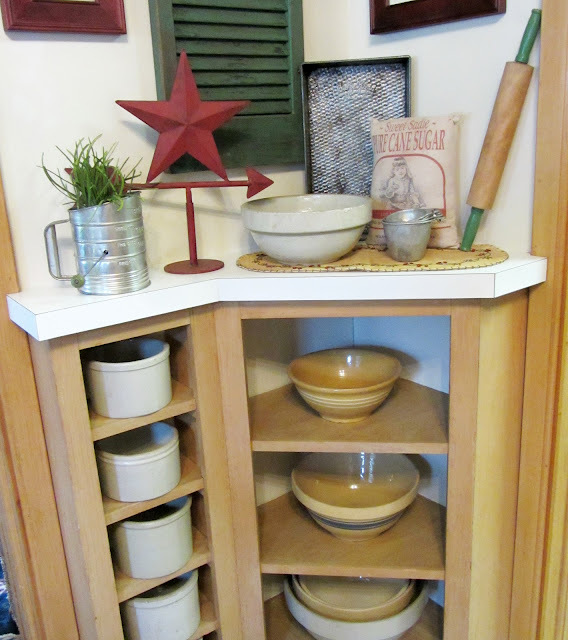 Gotta love open shelves for all of our fabulous vintage finds! New follower. What a great spot that you have decorated so nicely. I love the collections.